These can be observed well from urban locations. Saturn – Many people would agree that Saturn is the most beautiful object in the sky as it is truly amazing and a sight to behold. The planet color is a pale yellow with its blue-toned polar regions. The ring structure around Saturn is amazing to see and with ever increasing aperture more details are revealed. 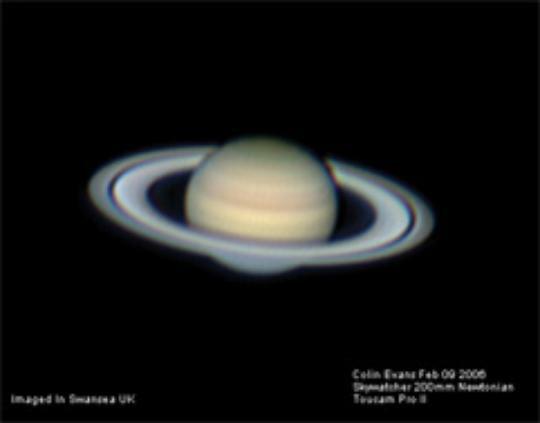 Saturn has 18 moons and with telescopes of 100mm (4”) and larger you can see the largest one (Titan). Jupiter – You can study the cloud belts and their varying colors, the bright equatorial zone which is framed by the belts, and watch its bright moons shuttle back and forth around the planet. Watch the Great Red Spot as it changes hourly. Mars – Observe this mysterious planet with its dust storms and orange hued deserts. The planets disk is a pale red color with its contrasting white colored polar caps which change is size during each year. You can see dark surface features. Venus – This is the brightest planet in the sky but it reveals very little detail. You can observe it going through its moon-like phases. In larger telescopes you can begin to see some dark shadows in its cloud patterns. Mercury – It is a tiny planet close to the Sun with a grayish colored disk. It is very difficult to see and the main thing to observe is the changing moon-like phases. Uranus, Neptune, Pluto – These planets are very difficult to see and there is no detail to see on these planets from amateur telescopes. You can see the greenish disk of Uranus and the turquoise disk of Neptune as well as the virtually colorless disk of Pluto with a 200mm (8”) to a 250mm (10”) telescope.